You want your home to be a safe place and that means providing an approved emergency escape where required. 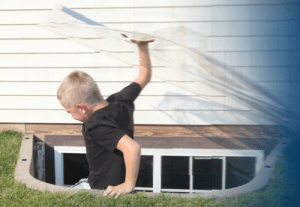 It is important to understand the minimum requirements of emergency escape egress windows before designing any new home or remodeling project. Here are the minimum requirements per UBC 310.4 of the Uniform Building Code. At least one operable window or door is needed from basements and every bedroom in less than 4-story buildings. Emergency escape egress windows or doors must open directly into public street, public alley, yard or exit court. 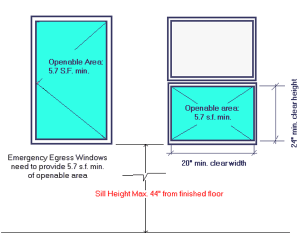 When planning your emergency escape egress window requirements you will need to take the following opening size requirements into consideration. These are minimum sizes and with the exception of distance off the floor larger is OK. No matter what egress window style you are using you are required to have a minimum window opening area of 5.7 square feet. There are three other minimum requirements. The window clear opening dimension must be at least 20 inches wide and 24 inches high. The maximum height from floor up to window sill is 44 inches. If your project will include an egress window in the basement then the following basement egress window area wall requirements will apply. The Uniform Building Code UBC 310.4 requires that escape and rescue windows with a finished sill height below the adjacent ground elevation shall have an egress window well or area wall. 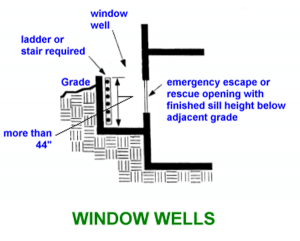 They further state that egress window wells at emergency escape or rescue windows shall comply with the following. The wells clear horizontal dimensions shall allow the window to be fully opened and provide a minimum accessible net clear opening of 9 sq. feet with a minimum dimension of 36 inches. 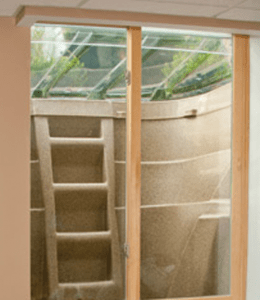 Emergency egress window wells with a vertical of more than 44 inches shall be equipped with an approved permanently affixed ladder or stairs that are accessible with the window in fully open position. The ladder or stairs shall not encroach into the required dimensions of the window well by more than 6 inches. Window Well Definition, UBC 224: Window well is a soil-retaining structure at a window having a sill height lower than the adjacent ground elevation. There are many commercially produced emergency escape area walls manufactured for easy installation in your project. Preformed polyethylene area walls have recently come into the market offering an affordable way to create an attractive finish to your emergency escape basement egress window. Most of the polyethylene area walls on the market include a built-in stair or ladder systems that make them compliant with required codes. If you are looking for a less expensive option then check out the corrugated steel area walls created with either galvanized or powder coated finishes. No matter which system you choose it is important to make sure that you follow the manufacturer’s installation practices to insure proper drainage of the egress window area. Failure to do this could result in unwanted leakage in through the window installation.